Take another card or stick? The aim is to get a better score than the croupier without going over 21. In Black Jack, cards 2-9 have face value, face cards and tens are worth 10 points, and Aces are worth 1 or 11 points, depending on the player's wishes. You can hold after the first deal (2 cards) or ask for an additional card. If your cards add up to over 21 points, you lose. 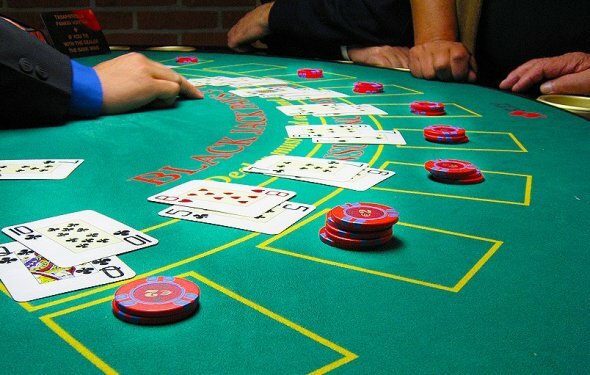 The croupier deals for the house when the total equals 16 or less and stops when it reaches 17 points or more. If your total is higher than the house's but under 21, or the house goes over 21, or you have black jack (a total of 21 with the first two cards) and the croupier does not, you win. If you equal the house, it's a tie and you get your chips back. If you and the house both have black jack, it's a tie. Some tables offer a 21+3 bonus, mixing Black Jack and Poker. That means you can win 9 times the bet!